Opening Programme features Oslofjord Ecologies Extended exhibition opening. The exhibition is based on results of artistic research processes following common workshops, field trips and earlier exhibitions and performances linked to the Creative Europe project Renewable Futures and the Nordic collaboration Hybrid Labs. Curated by Kristin Bergaust on behalf of Art in Society research group at HiOA, this cross-disciplinary exhibition includes contributions from visual arts, art and science, theatre, performance, design, visual culture, art didactics and urban research. See more. 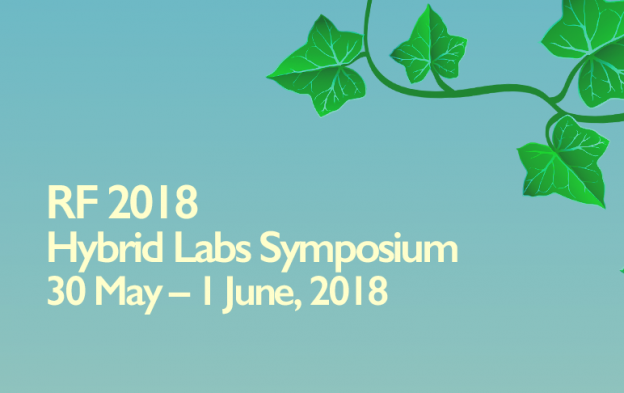 See programme Hybrid Labs Symposium 2018. Click for more information on Keynote speakers and their presentations. The fee allows for participation in the whole programme excluding Friday 1 June Dinner and coffees and snacks. This entry was posted in Art, Conferences, Event, New Media, Symposium, Theory on May 30, 2018 by Saara. KISS provides a summer experience that has both cultural and academic exchange between students all around the world. It also gives a unique opportunity to students to meet new firends and broaden their intellectual capacity in humanities and in engineering fields. This entry was posted in Event, Lecture on February 6, 2018 by Saara. Opportunity for Digital Scholars: New Scholars Seminar preceding the DH2017 conference – Apply by June 4th, 2017! CHCI, centerNet, WSU and KIAS are collaborating to organize a pre-conference seminar for new scholars interested in the digital humanities, immediately preceding the DH2017 conference in Montreal, Canada. We have arranged for financial support for up to 15 scholars to help with the costs of transportation, accommodation, mentoring, and a day-long unconference. The Kule Institute for Advanced Study at the University of Alberta is organizing this seminar on behalf of CHCI and centerNet. Rachel Hendery (Senior Lecturer in Digital Humanities, Western Sydney University) and Geoffrey Rockwell (Director, Kule Institute for Advanced Study, University of Alberta, Canada) will convene the New Scholars Seminar. This entry was posted in Conferences, Event on May 31, 2017 by Saara. We are looking forward to gathering a group of enthusiastic scholars, students and professional filmmakers to foster an interdisciplinary dialogue between moving image theorists, historians, critics, and philosophers, and scientifically-oriented researchers working on moving-image media. 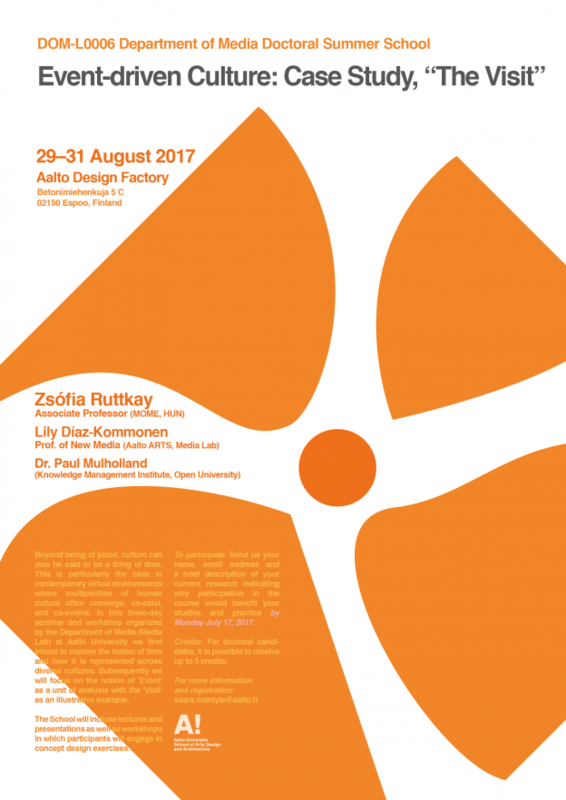 Exciting topics, prominent keynote speakers, three tracks of inspiring presentations ranging from philosophical inquiries to aesthetics to reports of neurocinematic experiments on film viewing, just to name few of many. Missed our paper proposal deadline? Consider participating anyway! 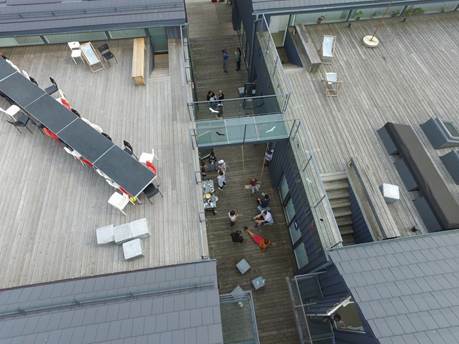 Aalto University School of Arts, Design and Architecture (AALTO ARTS) is one of the most prestigious international universities of art, design and architecture in the world. Key areas of research are design, digital media, audiovisual representation, art, visual culture, well-being architecture and emerging technologies, and urban planning and design. The school’s history dates back to 1871. The Conference includes presentations by internationally known experts in the field. A host of interesting social events are also being planned. In addition to the three and half days filled with three tracks of programmed presentations and discussions, the event includes professionally interesting site visits. 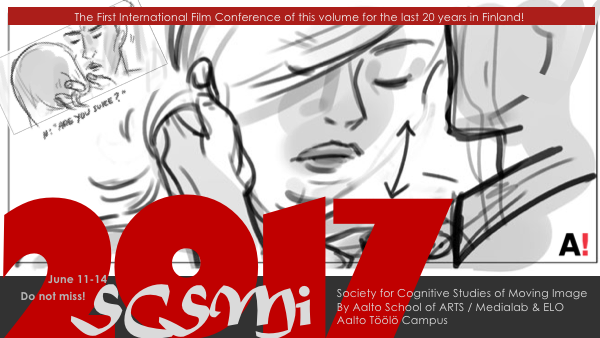 The SCSMI2017 conference is organised by the Department of Media, Crucible Studio with Dr. Pia Tikka as conference chair, and the Department of Film, Television, and Scenography – all functioning within Aalto ARTS. In association with the Department of Film and Television Studies, University of Helsinki. This entry was posted in Conferences, Event, New Media on May 16, 2017 by Saara. Taideyliopistoissa on tehty, ohjattu, arvioitu ja analysoitu tutkimusta, joka on perustunut taiteelliseen toimintaan. Taiteellisen tutkimisen ensimetreillä esitettiin kysymys, voiko jokin taideteko tai -teos olla taiteellista tutkimista. Tämä on vakava kysymys, joka koskettaa käsitystämme tutkimisesta. Tämä on myös vähemmän vakava kysymys, joka kuvaa suhdettamme taiteeseen: vaikka taide on elämän tärkeä osa, ilahduttaja, järkyttäjä, sulostuttaja, sen asema muiden ihmistoimien joukossa ei ole koskaan samanarvoinen muiden toimien kanssa. Taiteeseen liittyy aina yksittäisyys, minkä vuoksi emme voi olla varmoja, onko se tarpeellista tai välttämätöntä, edes sille yksilölle, jonka taidetta se on. Sehän voi olla vain jonkun erehdys, suuren luokan vitsi tai mielen hairahdus. Yhden ihmisen taito ei ole ennustettava, varma ja vakaa. Kirjan julkaisee Aalto ARTS Books. 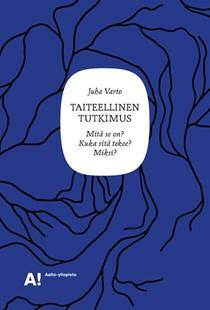 Aalto ARTS Books julkaisee kirjoja muotoilusta, mediasta, taiteesta, taidekasvatuksesta ja arkkitehtuurista. Aalto ARTS Booksin kirjamyymälä, Hämeentie 135 A, 3. krs. Aukioloajat: ma-ti 10–12 ja 13–16, ke 13–18, to–pe 10–12 ja 13–16. This entry was posted in Art, Event, Theory on May 10, 2017 by Saara. As Digital Humanities becomes increasingly recognized as a significant discipline and embedded in university curricula internationally, it is instructive to recognize that most scholarship relevant to the discipline is still predominantly from Anglo-American countries such as the United States, United Kingdom and Australia. The event aims to demonstrate how diverse cultural, intellectual and linguistic contexts can and even necessarily must fruitfully contribute to shape the future direction of the discipline. The 2 day seminar will be held at HY and Aalto University, and invites interested researchers from all levels (junior and advanced) to present and/or discuss their work, and students to take part. Thus, it will bring together researchers working on DH relevant themes beyond European and North American contexts, offer a platform for exchange on themes, methods and approaches, and in general, enhance the awareness for and visibility of DH research located beyond the hegemonic context. The reasoning for this is twofold: firstly, it is in the spirit of DH to encourage collaboration, remixing, and remediating, and secondly, to allow for a wider audience to access diverse culturally and locally inflected versions of DH in a quest to enlarge the scope of the discipline beyond the hegemonic. The event is free of charge, and we look forward to a fruitful discussion. The event is intended to have a workshop atmosphere, and also work in progress and esp. doctoral students are very welcome. The major reason is to bring together people in the larger Helsinki region working on various aspects of DH beyond Europe, and to get to know each other. We understand DH to include not only the level of developing/applying digital tools on cultural material, but also the level of researching digital media (f.e. social media) and their interaction with society. The deadline for submitting a note of interest and title/short abstract (~150 words) is now extended to 5th of May 2017. This entry was posted in Design, Event, History, New Media, Seminars on May 1, 2017 by Saara.